As soon as John Holland arrived in Santa Fe, he moved into a two-story house with W. Brian Arthur, a professor of economics and population studies at Stanford. Both Arthur and Holland, a computer scientist from the University of Michigan and a future recipient of the MacArthur "Genius" Award, had come to New Mexico to work at the newly formed Santa Fe Institute. The think tank was recruiting top scientists from a variety of disciplines to research the dynamics of "complex" interconnected systems like the economy, the environment and the human body. In the evenings, the computer scientist and the economist often sat at their kitchen table over a beer, discussing their ideas and research. Holland is a pioneer of genetic algorithms, which make it possible to do computer simulations of learning and evolution. Arthur, with a Guggenheim to Holland's eventual MacArthur, was among the first to study the role of interactions and positive feedback in the economy. This is a scientist's way of saying how something small like a dip in house prices can spiral into something gigantic, like a full-blown real estate collapse. "It was fortunate, as I didn't really know him at all," Holland said of Arthur. "We were both very interested in what the other guy was doing, so there is nothing quite like sitting at the kitchen table with a bottle of beer to help that out." The two men came up with an innovative idea: to model the stock market in a simple ground-up manner and populate it with virtual people, or "agents," who would interact with one another. The agents would abide by a set of rules that govern how they invest. The outgrowth of those talks back in 1987 was the Santa Fe Institute Artificial Stock Market, a computerized simulation that provided a radically different approach from the standard economic models, in which one theoretical agent represented everybody. It was also one of the first major accomplishments of the emerging field that Arthur termed "complexity economics," an alternative approach to economic theory that mainstream experts continue to shun. In his book, The Origin of Wealth, Eric Beinhocker defines complexity economics as "the broad range of theories, hypotheses, tools, techniques and speculations" that challenge the mainstream economic paradigm. They fall on a continuum between favoring a substantive revision of the current economic framework and replacing it entirely. Some approaches require complicated nonlinear mathematical equations; others, computer simulations. What unites them is the belief that our world must be modeled with all its imperfections, rather than in the way mainstream economists now portray it: as in an idealized, harmonious state of equilibrium. In the quarter of a century since Holland and Arthur shared a kitchen table, the field has grown to encompass an eclectic group of economists, physicists, ecologists, social scientists and computer scientists from across the world. Most recently, they have made major strides in how to apply their ideas, creating ever more advanced models and drawing stronger parallels from other disciplines. Yet many of the challenges that Holland and Arthur encountered nearly 25 years ago still beset complexity's supporters, starting with the struggle to convince economists in the mainstream of the program's worth. Skepticism — or worse, indifference — and their own ideological differences have made the path more difficult for the complexity group. But the greatest challenge has been reckoning with the sheer intellectual magnitude of their ideas. This does not daunt them. Complexity economists remain determined that one day the world will consider the implications of a complex economy, rather than one that is static and simple. Now, more than ever, might be the time for their ideas to gain traction. When the subprime bubble burst in 2007 and sent the economy spiraling into recession, it unearthed gaping holes in the standard academic approach to understanding the economy. Not too long before the crisis, economists were celebrating an apparent success in solving the major questions of macroeconomics, the branch that deals with the economy as a whole. Interest rates were low, unemployment was normal, lots of people seemed to be making lots of money. No major warning signals blared. And then suddenly they did. The widespread failure to foresee the crash rocked the economic profession; a flurry of articles and academic papers came swiftly, slamming economists for their failure to predict the crisis and trying to make sense of how and why their tried-and-thought-to-be-true methodology could have gone so terribly wrong. College professors abandoned their now-outdated textbooks and taught straight from their own notes. Calls for a redrawing of the boundaries of traditional economics came from professionals and laymen alike. In a hugely influential article for the New York Times magazine, Paul Krugman, the columnist and Nobel Prize-winning economist, argued that the experts not only failed to see the crisis coming but also failed to realize that such a failure was even possible. The piece was headlined, "How Did Economists Get It So Wrong?" a question he answered like this: "They turned a blind eye to the limitations of human rationality that often lead to bubbles and busts; to the problems of institutions that run amok; to the imperfections of markets — especially financial markets — that can cause the economy's operating system to undergo sudden, unpredictable crashes; and to the dangers created when regulators don't believe in regulation." For the sake of any lay readers, the term "mainstream economics" encapsulates a staggeringly broad discipline and isn't a label that economists fully embrace. For the most part, it applies to the set of viewpoints and perspectives espoused by the industry's top academic journals. Complexity economics emerged as a response to the inadequacies of this approach. To make their calculations feasible, mainstream economists assume that all the players and stakeholders in the economic sphere are fully rational and highly intelligent. They assume, in other words, that agents act like supercomputers with perfect powers of calculation and unrestricted access to all the world's information. This implies that all agents are the same, and can be modeled by a single representative that the profession facetiously calls homo economicus. Such models can be both convenient and informative, provided that the economists keep in mind how far these assumptions stray from reality. But sometimes, when prescribing policy, economists forget what they're assuming. As the Economist explained in July of 2009: "Convenience is addictive. Economists can become seduced by their models, fooling themselves that what the model leaves out does not matter." In the crisis, the assumptions of standard economics, it seemed, had betrayed its patrons. Back in 1987, the Santa Fe Artificial Stock Market attempted to factor in all of those inconvenient realities. In the model developed by Holland, Arthur and three other Santa Fe faculty members, the agents choose either to invest in a stock whose price and dividend (what a firm pays per share to its shareholders) fluctuate, or to bank their money at a fixed rate of interest. Like real people, the agents use their "rules" of investment to predict the stock's future value and decide how to act. They might, for example, sell their stock after a certain number of other agents sell theirs. They "learn" by trying out different rules and keeping the ones that bring profit. The researchers can then change certain rules to see how the change affects interactions, and ultimately, the entire stock market. Standard models of the stock market, and of the economy in general, are based on the premise that agents start off with the best set of rules. But the stock market has never been stable, nor has it stabilized over time. The general explanation for this is that forces like government intervention that are "exogenous" to, or exist outside of, the market, divert it from what it should theoretically look like, causing disruptions such as bubbles or crashes. In fact, when politicians and economists talk about a "free" market, they're really referring to one unencumbered by these exogenous forces. The Santa Fe team, however, demonstrated that traders could dramatically affect the market by responding with increasing force to each other's decisions—the positive feedback phenomenon. By playing with the rules, the researchers could see how the virtual stock market's bubbles and crashes originated at the agent-level. Even the actions of one individual investor could potentially reverberate throughout the market. They could see why some agents became ultra-wealthy super-investors while others seemed to always lose their money. Holland and Arthur conceived a model of the stock market that not only resembled the real thing but also suggested that booms and crashes were part of its fundamental structure. But did this breakthrough shake the profession at its core? Far from it. For the most part, critics wondered whether a more realistic model of the stock market would actually be useful in providing better policy ideas, the ultimate goal of the economic discipline. Kenneth Arrow, a Nobel-prize winning economist, was involved with the development of the artificial stock market. He agreed that the model was brilliant, but told me, "We don't know how to use it. It's clear that something is right about it, but we don't know how to use it." Even today, there is rarely if ever a mention of the Santa Fe team's invention in undergraduate economics textbooks. Now, in the aftermath of the recent subprime crash, the complexity ideas are suddenly topical. By this point the details of the financial crisis are clear and well-documented. A swarm of risky behavior characterized the financial sector before the crash. Home buyers took out excessively large loans, in hopes that they could be refinanced once their house values increased later; banks freely lent out risky mortgages, which they then bundled together and sold profitably. To invigorate investment, credit rating agencies eagerly gave these bundles high ratings, which isn't much different from stamping "ORGANIC" on a pack of low grade beef. Investors kept leveraging or borrowing money to fuel further investment in pursuit of greater profits. The U.S. housing bubble peaked early in 2006, but starting that June the growth in real estate prices slowed and homeowners started to default on their mortgage payments. By the beginning of 2007 the bubble had burst and real estate prices had plummeted. Banks began to hoard credit, and financial institutions like Bear Sterns that had leveraged heavily to invest in mortgage bundles saw the values of their assets collapse. Homeowners lost their homes and multibillion dollar companies went out of business. The crisis crept through the rest of the economy and instigated massive job losses and a global recession. Just like that, according to one study by the Brookings Institute, by the end of 2008 $14 trillion of wealth had vanished in the United States alone. Different economists offer different accounts for why this happened, but for the most part, the mainstream blames the miscommunication and misunderstandings on part of the individual actors. It's called "noise"—worthless, inaccurate beliefs that taint pure, perfect information and cause people to behave illogically. Aditi Thapar, a macroeconomist at New York University, explained, "Everybody was banking on house prices never going down. Now, there's not too many economists — not finance guys, but economists -- who will say that." But, she told me, for the sake of simplicity, "nobody builds into their model the possibility of house prices going down." The noise explanation implies that bad beliefs are indistinguishable from good information (otherwise everybody would be perfectly informed), so it is almost impossible to tell when the economy is headed towards crisis. Eugene Fama, a staunchly neoclassical economist at the University of Chicago, said in an interview with The New Yorker that it was easy "to say after the fact that things were wrong. But at the time those buying [risky assets] didn't think they were wrong. It isn't as if they were naive investors, or anything." Later he added, "We don't know what causes recessions." The risk generated in the lead-up to the crash was spread out widely, and many economists struggled to explain why that didn't cushion the initial blow of the housing bubble. They struggled to explain why, instead, the risk lit up across the system like gunpowder. Even Kenneth Arrow, the youngest person to ever receive the Nobel Prize in Economics (he was 51 at the time) and widely considered to be one of the greatest economic minds alive, seemed, like most other economists, puzzled by this counterintuitive result. (Complexity economists were equally surprised; their explanations only came after the fact.) He told me that banks, like insurance companies, spread their risk because when things go bad then more people are affected, but each one by a much smaller amount. "But that's not what happened," he said. "Somehow, because people are connected, the risk, instead of getting thinner and thinner, multiplied." Complexity economists point to the interconnectedness of the economy and to what is called a "positive feedback loop" in the markets (which had caused the booms and crashes in the Santa Fe Artificial Stock Market). This phenomenon compounded the system-wide effects of risky behavior, and their high damage potential. Instead of pinning the responsibility onto the agents, they place it on the entire system. John Miller became the Santa Fe Institute's first post-doctoral fellow in 1988 and has worked extensively on modeling complex adaptive social systems at both SFI and Carnegie Mellon University, where he heads the Department of Social and Decision Sciences. Asked what happened in the crash, Miller said simply that individual people were doing things that were good for them but not for the overall economy. "The incentives were all in line for every individual piece, so at every individual level people were acting very rationally and economists were able to explain that behavior," Miller said. "Where economists had a hard time was at the level of the system. When you compile all that individual behavior, the emergent behavior was quite unusual, and obviously quite dangerous." In standard economic theory, if everybody is acting in his best personal interests then it typically bodes well for the whole economy. But the situation preceding the subprime crash spawned an unsustainable kind of growth. Despite people knowing that they were engaged in risky behavior, they continued to do so because they kept making money, assuaged by the belief that the risk they faced would be shouldered by others. It spun a colossal spool of endless speculation and deferred hazard. "It's really an issue where you have this positive feedback loop where every element of the system was self-reinforcing every other element," Miller said. This kind of feedback meant that when things were going well — when housing prices were going up, when investments were generating high rates of return — the real estate and credit markets attracted more and more people eager for a share of the profits, and at each level the people and businesses intensified their behavior. But instead of soaking up all the profitability, the increasingly aggressive behavior further fueled the growth and heightened the risk (picture an amusement park pendulum ride that swings back and forth, going farther every time, and eventually it loops over). The positive feedback loop is what stoked a massive bubble in the economy. "Bubble" is almost too perfect a name. 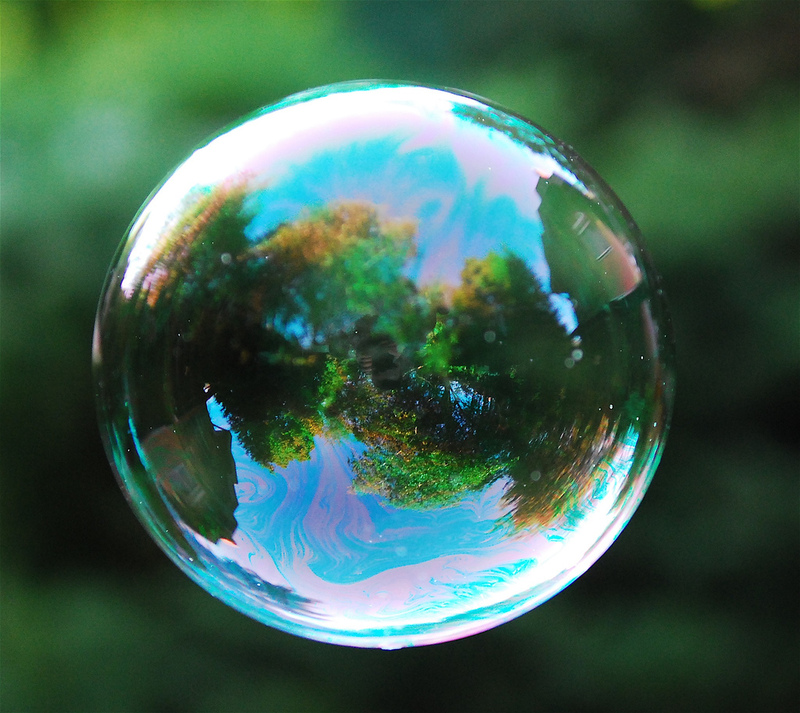 As a bubble expands in an asset market—or as prices artificially inflate with little substance behind them—the market becomes increasingly fragile, just like soap bubbles are more prone to popping the bigger you blow them. It starts when people buy the asset (something that can be sold for profit, like a house) because they think its price will go up and that they will be able to sell it for more money later. So people willingly pay more than what they think the house is actually worth. As more people do this, prices rise because of speculative demand. But eventually, something goes wrong. Some people default on their mortgage payments, for example, which causes others to panic about potentially falling prices and the value of their own homes. They sell; others follow and the cycle continues until an oversupply of housing floods the market and real estate prices full out plummet. Latent feedback loops and undetectable, seemingly harmless interactions can brew catastrophe. Something insignificant usually triggers the disaster, when it strikes at what Malcolm Gladwell dubbed "the tipping point" in his famous 1996 New Yorker article and subsequent book. Gladwell applied this idea to cascading white flight in neighborhoods where the number of black families reached a certain threshold. But the same could be said of the assassination of Franz Ferdinand that triggered World War I, or an electrical spark that causes an explosion when there has been a gas leak. It happened again during the credit crisis, when a few foreclosures toppled a bloated economy. The complexity-themed understanding of finance, which emphasizes positive feedback and systemic risk, has recently gained some favor in mainstream currents. In 2006, years before any thoughts of recession entered the public consciousness, the U.S. National Research Council joined forces with the Federal Reserve Bank of New York for a conference on systemic risk. More than 100 top thinkers from a range of disciplines gathered to consider what the financial sector could learn from experience with managing fisheries, pollination networks, climate change and even viral epidemics. They concluded that the increased efficiency and integration of the banking system could mean that it "may be evolving in a direction that makes it more fragile in some respects." After the crash, John Cassidy of The New Yorker wrote a story on what he dubbed "rational irrationality." In the October 2009 article Cassidy echoed the words of Princeton economist Hyun Song Shin and compared the crash to the instability of the Millennium Bridge in London when it first opened in 2000. As soon as crowds began crossing the bridge, it started to wobble. But the wobbling impelled pedestrians to step in synch as they tried to counter the bridge's tilt, which set off a positive feedback loop that exacerbated the vibrations. The pedestrians, Cassidy noted, were like banks that adjusted how much money they would lend out in response to drops in asset prices, which were parallel to the bridge's wobbling. But although the banks tried to respond appropriately, the resulting positive feedback only made the price changes more severe. "Once liquidity falls below a certain threshold," he wrote, now quoting Shin, "'all the elements that formed a virtuous circle to promote stability will now conspire to undermine it.' The financial markets can become highly unstable." When the shaking got too severe, London authorities closed the bridge, and banks sealed all access to credit. "The root problem," Cassidy explains, "is what might be termed 'rational irrationality'—behavior that, on the individual level, is perfectly reasonable but that, when aggregated in the marketplace, produces calamity." This is exactly what John Miller said about how individuals acted rationally but problems still emerged in the behavior of the overall system. When such a predicament is embedded within the structure of financial markets, or of any economic system, we need to fix the structure. "Consider a line of tree growing along a ridge," Miller said, drawing an analogy to interconnected economic systems. In wooded areas, landowners harvesting timber have an incentive to cram as many trees as possible onto their land, to maximize the size of their harvest. But in an excessively dense forest, even if a single tree catches on fire during a lightning storm the flames can quickly spread to nearby trees, and soon transform into a conflagration raging through the woods that destroys huge swaths of forest. "You need to build firebreaks [areas of bare land between trees] so local conditions can't spread and cause everything to go up in flames," Miller said. "And there is an optimal distribution—too many firebreaks and you're not growing enough trees, but if there are too few, then there is a high possibility that you'll lose a lot of trees. So you have these trade-offs." In this case, Miller added, the most profitable solution for society is not necessarily how the landowner would prefer to act. The government has to step in, and the situation is analogous to economic regulation. "Economic phenomena such as interbank loans or chains of credit default swap holdings may be subject to a forest-fire-like dynamic, suggesting that carefully designed 'firebreaks' might be needed if we want to maximize the 'harvest,'" said Miller. It often takes a crisis for people to fully recognize that their ideas and toolkits are inadequate. The crisis was horrible, but it also might be the impetus for new kinds of thinking and theories to arrive. Illustrative analogies are a staple of complexity economics, which thrives on cross-disciplinary discussion. During my research I came across a Seed Magazine article from February 2009 on the work of Simon Levin, a biologist at Princeton, on parallels between financial and ecological systems. Levin, a pursuant of complexity himself, was at the New York Fed's conference on systemic risk, and for many years he has flitted around the line between economics and ecology. "I've come to understand," the article quotes him saying, "that they're the same kinds of systems." He said that the robustness of both environments and economies (and adaptive systems in general) stems from their diversity and their compartmentalization, or their being separated into tightly knit clusters that only loosely interact with one another. It's the same idea as firebreaks, or, as Levin described, "You can think of it as a lot like saving your work when you're writing a manuscript on the computer." He said that by losing its modularity and becoming overconnected, both the financial sector and the entire economy became vulnerable to collapse, in the same way crowded areas where people heavily interact with one other are vulnerable to infectious diseases. "The disease might spread within one such group, basically slowing down. But if everybody has equal access to everybody else, then the system might collapse," he said. When the financial system became overconnected, he added, "you've lost the modularity and therefore when disturbances start to spread, they spread to Iceland, they spread to Greece, they spread everywhere. No part of the system was isolated enough to provide protection, well maybe China but even China was infect...err, affected." Viruses present another problem: they evolve. That's why scientists must constantly develop adaptive new vaccines to control flu outbreaks. At the 2006 conference, Levin said, they determined that financial regulation must be similarly adaptive. "I think we can predict that whatever regulation you're going to put in, people are going to find a way around, so you don't want them to be too rigid. Allow for the rules to change," he said. "One way to do it is to build in a control switch that turns on or off if the market changes too much in a particular day." This is what the Federal Reserve does. It influences investment by manipulating the interest rate, which it bases on market signals. But the Fed has no power to regulate, and nothing of the adaptive sort exists for the regulations already in place, nor in the new ones proposed by the Obama Administration. These ideas, though incomplete, present promising ways to prevent future financial crises —and suggest why the crisis might also signal a shift in the entire approach to economics. And it's why Miller said, "It often takes a crisis for people to fully recognize that their ideas and toolkits are inadequate. The crisis was horrible, but it also might be the impetus for new kinds of thinking and theories to arrive." Much of the intellectual basis for complexity economics originated at the Santa Fe Institute, and much of the work from the Santa Fe Institute originated from interdisciplinary thought. In 1986 John Reed, then CEO of Citicorp, had a research question and for a solution approached George Cowan, a veteran of the Manhattan Project who had founded Santa Fe Institute three years earlier. Reed was frustrated with his economists' inability to predict spiraling failures in Latin American debt payments, and wanted to fund research on an alternative approach to economics. Cowan was a physical chemist by trade, and his institute had so far focused on broad themes in the "hard" sciences. Could the economy join that club too? In 1987 the Institute invited top physicists and economists to a ten-day workshop to discuss the state of each profession and to consider how they could push the economic frontier. The physicists included stalwarts like David Ruelle, a founder of chaos theory, and Doyne Farmer, who became notorious for using nonlinear physics to win at roulette in Las Vegas. They were shocked by the simplistic assumptions central to economic methods, which the physics notion of static equilibrium inspired a century earlier; one participant compared the experience to a recent visit to Cuba, where the U.S. embargo that sealed the country from Western imports for 40 years prompted mechanics to invent ingenious methods keep ancient cars running. Beinhocker wrote in an account of the workshop that the physicists felt as if "economics had been locked in its own intellectual embargo, out of touch with several decades of scientific progress, but meanwhile ingeniously bending , stretching, and updating its theories to keep them running." The economists, on the other hand, who counted big names like Larry Summers, the present director of the National Economic Council, thought the physicists had interesting ideas but were being naive about economics; the assumptions were necessary in order to do anything of value. The question raised at this meeting became the foundation of the economics program formally created afterwards, with Arthur as the director, and over the next fifteen years its researchers pursued the idea that the economy was a "complex adaptive system" that was constantly evolving. What exactly does "complexity" mean? The answer is, ahem, complex. Complexity economics is an aspect of the roughly structured field of complex systems research that explores the relationships between "building blocks" (Holland's terminology), be it atoms or species or economic agents, and the living, adaptable systems that they're part of. Its driving force is a belief that outcomes tend to be something you wouldn't imagine from just observing how things interact up close. It's the quintessential not-seeing-the-forest-for-the-trees phenomenon, what complexity scientists of all types call "emergence." Emergence occurs everywhere. It happens when individual ants responding to chemical stimuli form an organized colony, or when changing atmospheric conditions construct perfectly symmetrical snowflakes. It happens when a diverse network of individual cells interact to create life, or when metal atoms spin in synch to create a magnetic field. It happens when millions of investors around the world, trying to maximize their own profits, consequently drive a stock market that regulates the asset prices of companies. Emergence exists whenever a pattern seems to "emerge" from chaos, and complexity scientists seek to understand just how it occurs and what it says about our behavior. That is no easy task, and that's why there is no widely accepted definition yet for complexity as it applies to the economy. Steven Durlauf, a former director of the SFI Economics program, tried to define it in a 1997 article for The Washington Quarterly. He mentions a few complex properties about the economy that most complexity economists have agreed on. There is direct interaction, which affects individual choices, and positive feedback of course, which is what happened in the housing bubble. These assumptions prompt complexity economists to argue that we need to regard the economy as a movie instead of a series of screenshots. That is, we need to analyze it as it constantly evolves and changes in unpredictable ways rather than study fixed moments of equilibrium like most economists typically do. They claim that economic models must consider what's known as path dependency—basically, that history matters in future decisions. Path dependency is quite a simple and familiar concept. It's what happens when you make the wrong move in Solitaire, only to find out several turns later that it is impossible to win. (Full disclosure: I played a lot of Solitaire while writing this story.) Durlauf, and complexity economists in general, assert that conventional methods do not suitably measure the effects of complex properties. For example, consider families deciding whether to send their child to college. Suppose each family will only pay up to a certain "threshold" level of tuition, beyond which they would decide that college just isn't worth it. Since the threshold amount varies for each family, based on its income and preferences, if you looked at all the families then you would come up with a neat, linear relationship between the cost of tuition and the number of families willing to pay it. Most economists would call this the demand curve for college tuition. But, Durlauf argued, the story doesn't end there. While a family may stick to its tuition threshold when acting in isolation from other families, it would raise the threshold if it knows that many families are sending their kids to college, and lower the threshold if only a few families were doing it. These positive feedback effects distort the real demand curve for college, he wrote, so the one we had earlier only paints a half-picture of the truth. Complexity advocates claim that mainstream economics fails to account for how these emergent properties affect the economy. Mainstreamers would counter that these properties are captured in the value people place on a good, and therefore, the assumption of full rationality and information provides a sufficiently accurate estimate. But to complexity economists, the failure of this logic in the crisis is proof that complex properties must be considered. Complexity economics has been around for roughly 25 years, which on an academic timescale makes it an infant. It is still considered a heterodox, or nonstandard, tradition. But that may change. "Complexity is an idea on the tip of the modern tongue." The economic journalist David Warsh wrote those words in 1984 and now considers them among the "most prescient sentences" he ever wrote. Steven Hawking, the world-renowned physicist, famously called complexity the science of the 21st century. If the crisis prompted the entire economic paradigm to shift, then is complexity at a cusp? The answer depends on whom you ask. If they are at all familiar with complexity economics, many mainstream economists do not expect serious contributions, unless it attains what one economist described to me as a "huge breakthrough that totally changes how you do everything." But in my interviews with researchers and economists who have done work in complex systems, I found that most of the time people thought that complexity will indeed be a integral part of the future economic paradigm. Some envisioned a future where complexity ideas merge into with the mainstream economic approach, filling in where the traditional theory was weak. Others were more radical, and insisted that complexity economics will replace the present mainstream notions altogether. Magda Fontana holds the latter view. An economist at the University of Torino in Italy, Fontana has documented the history of the Santa Fe Institute and is currently writing a book on complexity economics. When I Skyped with her last month I asked what she thought will happen to the existing economic framework. "We're facing the end of neoclassical economics," she tersely replied. "We're facing the rise of complexity, and maybe in the future we will have a new orthodoxy. Complexity will be on the forefront of a new wave of economics phenomena." I asked Fontana why she felt this way, and she said it was because there is a "growing frustration with orthodox economics" and economists are beginning to see the broad, general theories pushed forth 20 years ago as irrelevant. Moreover, the emerging complexity view is irreconcilable with existing economic beliefs, so they are likely to be displaced completely. "Complexity economics and traditional economics are like oil and water," Fontana said, "they cannot mix. They subscribe to different worlds, which work in different ways, they use different instruments." She told me she thinks that neoclassical economics will be reduced to a historical "benchmark," in the same way that Lamarck's Theory of Acquired Characteristics is a benchmark in the history of biology. In a way, Fontana's own history provides testament to the growing strength of the complexity movement. As a graduate student, she was fascinated with agent-based models, and designed one to model the effects of eliminating trade barriers in the European Union for her dissertation. It was the early nineties and most economists were still skeptical of computer simulations. The panel awarded her the Ph.D., but warned her to "stop playing with video games." Economists have since warmed up considerably to agent-based modeling, which is steadily becoming a more popular tool in economic research. By searching on Econlit, an Internet database of academic articles on economics, I found 31 articles that involved agent-based models from 2000; 44 articles from 2004 and an impressive 103 articles from 2008. (Full disclosure: I didn't click through each result so it is possible that some of the articles actually criticize agent-based models. But it is also certain that they are being taken more seriously.) Complexity economists are quick to acknowledge the significance of this growth. Referring to her university professors, Fontana said, "Now, we are playing games together." From the grainy video I could just make out what looked like a wry smile. Fontana is not the only one who feels so strongly. She borrowed the "benchmark" idea, for example, from Arthur, who declined my request for an interview. But many, if not most, complexity economists believe that the complexity and mainstream approach can coexist, and even complement each other. I also spoke with Fabrizio Lillo, a young physicist at the University of Palermo and the Santa Fe Institute who has been working on a branch of complexity economics known as econophysics. He told me that it was folly to reject, as some do, the achievements of mainstream economics and that complexity should work alongside the other approaches. "I don't believe, and I'm totally against, anyone who says that economists don't understand anything and that physicists and mathematicians should be the ones doing everything. I think economists have done a great job," he said. "What I'm saying is that the problem is complex enough that you need several different perspectives of the problem to have a unified view, in some sense." Econophysicists insist that statistics and physics are invaluable tools in understanding the economy, sometimes even proclaiming that economic theory is so useless that it should no longer be taught in universities. During our interview, Lillo hardly called for the dismantlement of the economic discipline. But he did allow as how complexity economics is far better suited to incorporating statistical data into economic modeling than traditional methods are. "The future of socioeconomic science lies in the availability of a huge amount of data of economic and social origin in general, which is something that is completely unprecedented in economics," said Lillo. "Now, of course, with the Internet and the electronic revolution, we have access to huge amounts of data and of a quality that was impossible to access a few years ago." "It feels like having a new microscope," he added as afterthought. "And I'm not sure that traditional economics is ready with the tools to use this new microscope." While econometrics and statistics are major components of the broad study of economics (generally economics students, graduate or undergraduate, cannot complete their degree without at least taking one course in either subject), statistical analysis is not integrated into the standard micro and macroeconomic models themselves. Methods like agent-based modeling, however, provide researchers with a much greater scope to weave statistical data into the model itself, and to tailor the models to specific situations. Certain branches of mainstream economics, such as experimental economics, do rely rather heavily on computers. But even they don't embrace computation on the fundamental level that complexity enthusiasts do with their agent-based models. "From the point of view of theory, math is the reference discipline for mainstream economics," Lillo said. "Complexity economics is more computer science, more physics-oriented." That's why the exponential growth of data, computing power and the Internet in recent years are at the heart of perhaps one of the most compelling cases for complexity economics. Twenty years ago there was very little economic data available for researchers, but today they have access to more information than they can handle. Stephen Guerin is the president of a Santa Fe-based group called RedFish that designs agent-based models and visualization for clients (there is a whole industry of such companies) "In the last ten years, it's remarkable how much data is exploding," he told me. "I'm working on a model of boat traffic in Venice, and we have all the GIFs in Italy. Hundreds of layers of GIFs to apply to the [virtual] city that we don't have to go out and gather. The point now is that we can go to firms and immediately start to visualize their systems, using agent-based models to fill in the gaps." In a special report last March called "The Data Deluge," the Economist reported that mankind created 150 billion gigabytes of data in 2005, but will create an estimated 1.2 trillion gigabytes this year. Not all of that is economic data, of course, but economic data invariably exploded with the rest. These factors affect our ability to understand the economy, the tools we can use to do so, and the very way the economy works. This kind of technological growth can not only affect our ability and the tools we have to understand the economy, but it can also change the very way the economy works. An enormous array of fields, from genomics to physics to engineering, have benefited greatly from faster computers and freer information. Complexity economists ask, why can't economics benefit too? Technological growth aside, Miller said that the entire economics field was in a unique position that boded well for complexity economics. "One," he said, "we had a crisis and almost no one predicted it ahead of time and no one really knew what to do about it and two, over the past ten to twenty years you have also had the rise of behavioral and experimental economics which have started to push the boundaries and make people rethink, 'okay so we have this standard model in economics but it doesn't seem to be explaining what individuals are doing that well.'" He said that economists have always thought that it was important to consider how economic systems dynamically changed and the impact of nonlinear phenomena like positive feedback, but until recently did not have the tools (like powerful computers) to deal with those things. The new tools and attitudes will be reflected in models used in the future. David Colander, a historian of economic thought at Middlebury College, has written about complexity economics, agent-based modeling, and the state of the economics profession. "Now," he said, "there is a broader acceptance that the economy is complex and probably the models that we will have to use will go beyond what the analytical ones we had in the past [and still use today] could provide. And agent-based models are one of the many groups of models that we can use." "It's a technological advance, and technology drives our understanding," he said when I asked for his thoughts on agent-based models. "As technology changes, research methods change, approaches change, methodologies change...and it should change!" But he pointed out that in any academic discipline new methods and models tend to emerge to much hype and fanfare, only to reveal later that they couldn't solve all the problems they were expected to. "The sociology within an academic profession tends to overstate what a particular model is going to do," he said, adding that there is nothing special about agent-based models indicating that they would be any different. Regardless of how accurate the predictions of complexity's supporters will be, they've got some unmistakable facts in their favor. Globalization has made the world more interconnected and the economy more complex, a trend that is not slowing down. The expansion of the Internet has not only made data more freely available but also created more intricate economic connections. Our networks of interactions continue to expand and stretch around the world. As complexity economists strive to better fit their theory to use in the world, it seems as though the world may also be becoming a better fit for complexity. But at the same time, the approach is still years away from becoming a full-fledged paradigm that can be adopted and used in policymaking. Just as complexity economists have a multitude of smart and interesting ideas, mainstream economists have a multitude of reasons for not adopting their model — at least not yet. Kenneth Arrow, who made major contributions to mainstream economics, chaired the first major meeting of the SFI Economics program, in 1987, and advised the Artificial Stock Market team on how to present. He said that complexity economics can help to explain what author Nassim Nicholas Taleb has labeled "Black Swan Events," or rare, high-impact events that can only be rationalized after they occur. Arrow specifically mentioned Black Monday, the infamous October 1987 day when the stock market inexplicably dropped 22 percent. "Nobody knew what happened...there was no bad news that day," he said. Arrow explained that the sudden drop was "a network phenomenon, it spread, and it got more and more complex as it spread." He told me that because complexity theory was based on interactions, "these are the sort of things that complexity economists have something to say for." In the future, "people will derive specific theories informed by the spirit of complexity and that'll be useful," said Arrow. He suggested the development of an "inefficient market hypothesis" based on complexity postulates like positive feedback and "rational irrationality" to counter the widely held premise that markets are efficient. Yet during our talk, Arrow still questioned the overall usefulness of agent-based models, and had no qualms about criticizing the complexity approach. "Complexity economists give you insights that make you say 'huh,' and certainly the current financial crisis is a good example because it looks like the edge of chaos." he said. "But you can't say that this is the policy — you need to say we need to stay away from the edge the chaos. Policy really means forecasting, if you change this then this good thing will happen. That's the kind of question an economist wants to address. "[Complexity] is an insight," he said, "but it can't give you a normative statement." In economics, ideas crucially need to be capable of shaping policy. They need, at the very least, some surface tension. The economy is enormously complex — think about everything ever produced and purchased. It defies complete categorization. When people talk about the economy they don't talk about an entity in the way the government is an 'entity.' They talk about a system that pervades every innocuous detail of our material lives, every ostensible thread of our society. Few things are as intricately linked to our existence as the economy is, except perhaps for our personal relationships, our basic needs and life itself. Of course each of these is touched by the economy, too. Complexity is a field that is still trying to find its soul. By embracing this mind-boggling intricacy, the basic premise of complexity economics is also a curse. Complexity economists grapple with the practical consideration of incorporating bounded rationality and the dynamics of complex systems into verifiable models in a meaningful way. For example, there are infinite ways to model agents who are not perfectly rational — they might behave in their own interests to varying degrees, but they might also be altruistic, or they might make silly mistakes. Picking the best method of doing making these determinations is daunting. But it is also a prerequisite, if proponents want to finish constructing a complete complexity theory of economics. As a social science, economics needs to suggest ways to make our society better. Until complexity economics has a complete and valid theory, it will not be able to offer any serious policy prescriptions and will continue to solicit apathetic reactions from the mainstream. The standard model, at least, exploits its unrealistic assumptions to provide logical conclusions to many economic problems. Harald Uhlig is a professor and chair of the legendary University of Chicago economics department, one of the most revered economics institutes in the world and a bastion of neoclassical economics. "The success of each subdiscipline [of economics], of each author, depends on how well it can resolve key questions � there is no 'a priori' exclusion of any particular approach," Uhlig said, adding, "I have not yet seen convincing work on explaining the financial crisis" using a complexity approach. It couldn't be more clear. If they want the rest of the profession to listen, complexity economists need to present unique solutions to the principal economic questions that embroil our times — from preventing credit crises to alleviating global poverty." I met Aditi Thapar in her office at NYU. After dozens of mainstream economists turned down my interview requests on the grounds that they had little to say (testament to complexity's relative obscurity), she was among the handful to respond. Thapar herself was reticent to speak for this reason, but she told me that the major question was, "Are their ideas telling us anything more than what we already know? To some extent, if they're telling us what we already know, then I'm just going to be like, Okay. The ideas are nice, they're sweet and cute. But either then it needs to have broader implications or applications or tell you, 'Oh, look. I can do so much with this.' It has to have something which it adds to, something that is novel, new and exciting." In the middle of our interview a smiling man carrying a brown paper bag entered the office. He pulled containers of sushi and miso soup out of the bag and placed them before Thapar, leading her to remark casually that her lunch equation had been solved. The man was her husband, John Leahy, also an economist at NYU. He joined our conversation and said, "Complexity answers how lots of different agents doing stuff can lead to really pretty patterns. And the question is, what questions do those patterns answer? And that's not obvious." He laughed, adding, "That's all cool, but 'cool' doesn't get you to the next level, and that's the problem with the whole field and why it's basically delegated to a couple guys over in Santa Fe who basically don't talk to anyone." He later said, "It's not that it's not interesting, it's just that it's not useful to my life." Complexity economists readily admit this shortfall, but chalk it up to complexity being a fledgling field still under construction. Miller explained that, "I think at the moment complexity economics has a bunch of very intriguing metaphors, and some nice messages telling us to start thinking about questions like these. But is it at a stage where you can easily take [the models] and say, 'Okay, do this or do that'? Probably not." Then he added, "But then again, it's not like we have many tools at the moment where we can tell it exactly what to do." Lillo put it existentially: "Complexity is a field that is still trying to find its soul." The systemic explanation for the subprime crisis was only a start, an indicator of the theory's promise. But even complexity economists could not foresee the system-wide dangers of the bubble until it actually happened. Troy Tassier, a Fordham economist and an advocate of agent-based models, said, "The folks that were doing ABM weren't standing around saying, 'Well this is all wrong, we're about to head to Armageddon in the banking system' or something." He went on, "You know, you can critique the neoclassical approach and say that maybe they missed a note here and there and you can maybe say that a more computational approach to economic forecasting would have been useful, but you can't make that claim too strongly because we're not there yet." The novelty of complexity economics, proponents say, is also a reason why no coherent theory of complexity exists. After he earned his Ph.D. from the University of Michigan, John Miller helped to design the first Internet-based stock market at SFI (not to be confused with the Santa Fe Stock Market, which is a simulation) to understand the dynamics of how prices form in simple markets. He is easily one of the world's foremost experts on complexity economics but told me, "Nobody really understands what complexity is." We both laughed, but he was making an important point: even though complexity economists occupy a relatively small figment of the economics profession, they aren't unified in their approach. Across the world, complexity economists resemble members a multifarious militia more than an organized platoon. They differ in how radical they view their work to be and what methods they use. Agent-based models are just a part of the complexity goulash; to name a few, people also use a method of linking complicated differential equations know as system dynamics, as well as microsimulation, which is like agent-based modeling except with a heavier emphasis on the agents' rules. The history of the SFI Economics program, which for many years led the way in complexity economics research, shows just how conflicting people's definitions of complexity can be. The consensus after the original 1987 workshop was that the program should tackle the things that mainstream economics could not already explain. In a summary of the meeting, Arrow wrote, "The general perspective of mainstream (the so-called neoclassical) economic theory had certainly had some empirical success...But it is clear that many empirical phenomena are not covered well by either the theoretical or the empirical analyses based on linear stochastic systems, sometimes not by either." But through the first half of the 1990s, the more radical scientists like Arthur and Holland steered the "Santa Fe perspective," as it was known, away from mainstream thought. That was in the years after the creation of the Santa Fe Artificial Stock Market, as the notions of complex adaptive systems and the effects of social interaction and networks on the economy developed. In a paper she authored last year documenting the Sante Fe perspective's evolution, Magda Fontana, the woman with the "video game" dissertation, wrote that although the SFI Economics program never achieved a coherent view of what "complexity economics" meant, "initially complexity economics was conceived as a small add-on to neoclassical economics, whereas by 1997 some researchers were proposing we...use it for a benchmark." In 1996, SFI staged another workshop on complexity economics, this time focusing on understanding the economy as a complex adaptive system. Academics gave the workshop's proceedings a favorable reception and commented about the new movement's growing recognition and slow penetration of the leading journals. But at the third workshop in 2001, Steven N. Durlauf and Lawrence Blume, who took over as co-directors in 1995, issued a strange statement. "The models presented here do not represent any sort of rejection of neoclassical economics," wrote Durlauf, the Kenneth J. Professor of Economics at the University of Wisconsin-Madison. "One reason for this is related to the misunderstanding of many non-economists about the nature of economic theory; simply put the theory was able to absorb SFI-type advances without changing its fundamental nature." Durlauf and Blume, an economist at Cornell, had diverted the Santa Fe Perspective back to the mainstream. Fontana called this shift "surprising," especially considering the successes of the previous decade. For several months, Durlauf did not respond to my requests for an interview. Eventually, I did receive an email from him in which he apologized for the delay and wrote, "In any event, I am no longer much interested in complexity and economics and have not dealt with SFI for a while, so I prefer to pass on this." I replied asking him why he lost interest, but he did not respond. Today, the SFI Economics program, led by Sam Bowles, looks nothing like it did under Arthur. Bowles, an economist from the University of Massachusetts who studied at Harvard with Milton Friedman, took over as director in 2000, and in Fontana's words, "scuttled" the heterodoxy and "sailed straight for the mainstream." For better or worse, SFI now emphasizes behavioral science over inspiration from statistics and biology. But SFI is far from being the only center of complexity economics research. As several people explained to me, new centers have sprouted up across the globe. John Holland spoke of a complexity "orbit" forming between SFI, the Institite Para Limes in Europe, the Chinese Academy of Sciences and the Nanyang Technical Institute in Singapore. "There is a substantial group of people that believe that there is a great deal to be learned in this area and to take what Hawking says seriously," Holland told me. Still, these pockets of research go, for the most part, unsynthesized. Fontana told me that there wasn't much communication between the various proponents of complexity economics. "My impression is that they are all focused on their own research," she said, "and they are not really concerned about discussing complexity." "It's as if they are not interested in creating a school of thought," Fontana went on. "They are convinced that complexity is the way to go, but they are not interested in the connection. Dialogue implies confrontation to a certain extent, if you don't talk with people that speak your language, it hinders progress...and it makes the spread of complexity more difficult." Despite the challenges they still face, complexity economists see a good harbinger in the development of experimental and behavioral economics. Over the past 20 years or so the mainstream paradigm has absorbed these approaches that straddle the gulf between standard and complexity ideas. Experimental economists conduct laboratory experiments to test formally how accurate economic theories are in real life, often finding that people behave much differently than what the theory predicts. Behavioral economists explore how social, psychological and emotional factors affect our economic decisions. Research in both fields began over 50 years ago, and in 2002 experimental and behavioral economists won Nobel prizes for the first time. If the complexity camp can discover the right methods and can helm the call for a new approach after the recent financial crisis, it too can join the likes of its experimental and behavioral counterparts. But this may take still more time. As we concluded our interview, John Miller mentioned that in science, it takes a lot of evidence to break old paradigms. "People are normally skeptical of new ideas, and that's usually a good thing," he said. "If we adopted something right away every time someone said, 'I have a new way of doing things and it's better,' then science would be a mess."